I have this approach I’ve noticed when faced with a job I don’t necessarily want to do on one of my cars, it’s called procrastination, you might have heard of it. As necessity is the mother of invention it is just as strongly the enemy of procrastination and I it took me having two unavoidable reasons and a little good luck to effect an almost final fix for this fuel pump issue. The first good reason was the need to give Kip back his SU fuel pump that was given temporary duties on the SV (I was going to see him on Sunday at a shop warming party), the second is the requested attendance of this car at Pixar’s Motorama this Friday afternoon. The little bit of good luck was a friend having a new Facet fuel pump kit bought specifically for a weber equipped Giulietta Spider that was no longer in his life. With no good rationalization left to enable procrastinate, I went to my shop yesterday determined to mount, plumb and wire the new fuel pump. 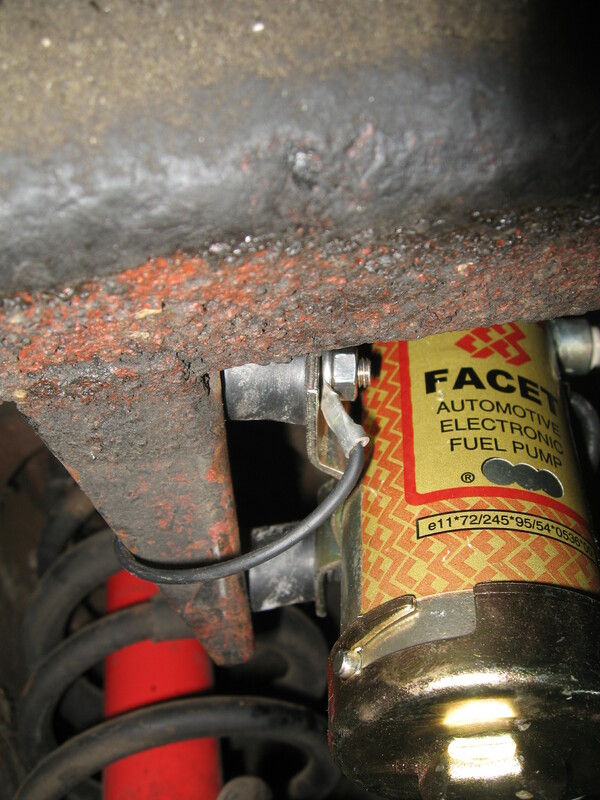 Nice new Facet fuel pump hanging out with 50 years of scummy crud on the underside of the Sprint Veloce. Note shock isolation mounts, like little motor mounts, and grounding wire. I purchased my Sprint Veloce March of this year (2008) . The car had been gone through mechanically by a local vintage Alfa Ferrari Lancia mechanic who specializes in long involved rebuilds to a high standard. While great care was taken in the set up of the SV, it had been about 4 years since its mechanical setting-up was completed and it didn’t receive more than a few hundred miles of break-in. What it did receive is a lot of dis-assembly, rust repair, then reassembly. No real teething drives were taken after this. I put the car on the road after a thorough cleaning and reinstalling the interior pieces and spending about 20 hours stabilizing the wiring in the car to fix some little problems like 4 volts at the headlights, brake lights only when the headlights were on and no turn signals or horn or gauge lights… you get the idea. Woe is me to be laying in rough gravel under the car roadside in 80+ degree heat sleepy from a belly full of lunch getting grease and gasoline all over my arms. Why is the fuel pump not in the trunk or under the hood?